When it comes to social media, there are so many numbers you could track – likes, followers, shares or retweets, and more. How do you know which are the most important, or even worth tracking at all? How do you get started with social media for small businesses? 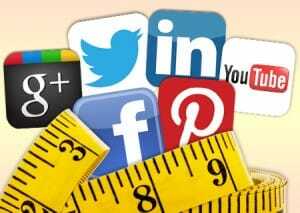 If the social media metrics you’ve been tracking don’t contribute to at least 1 of those things, it’s time to reevaluate your measurements. According to Marcus Sheridan of The Sales Lion, the most misleading social media metrics are often the easiest to track, such as followers, likes/retweets, scores or rankings. While these numbers can be useful for tracking reach and brand awareness, these “vanity” metrics are not the most important for businesses and are often grossly misinterpreted. So what are the most important social media metrics for businesses? Honestly, the answer to that question varies from business to business, and depends heavily on what your goals are. Measuring reach and brand awareness metrics like these shows you what types of content spread well and on which platforms. That helps you improve your strategy and be smarter about how you use social media. These lead and sales-oriented metrics help you calculate the ROI of your social media strategy which is always an important part of any marketing plan. In fact, lead generation and sales metrics are the ones Chris Brogan prefers to track because the make the most sense for most businesses. But at the same time, he urges businesses to determine their own highest priority metrics. You are the only one who knows what’s best for your company. Other business goals may include trying to build a loyal community, improve customer experience, or maintain a good brand reputation. These engagement-oriented social media metrics can be a little harder to track than number of likes or followers. But that’s a good thing: it means these metrics are closer to showing you if what you’re doing is actually working. If you’re still not sure what social media metrics to track, or think you need to monitor all of the metrics listed above, Social Times lists the top 10 metrics they believe businesses should track. Their list incorporates lead generation, brand awareness, and community building metrics, making it a good place to start. What social media metrics do you watch? How did you decide which were the most important for your business? Please share in the comments! Good post. I learn one thing more challenging on different blogs everyday. It should always be stimulating to learn content material from different writers and observe a bit of one thing from their store. I’d want to make use of some with the content material on my weblog whether or not you don’t mind. Naturally I’ll give you a hyperlink in your web blog. Thanks for sharing. I’ve learn several just right stuff here. Certainly price bookmarking for revisiting. I wonder how a lot effort you set to make such a fantastic informative web site.